Perfect for flush rail or for easy-on, easy-off installation on exposed rail. Powerful rare earth magnets hold sign in place. Aluminum pole with handle. 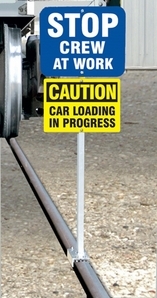 An extension rod allows the OSHA mandated Blue Flag to be displayed with a related CAUTION or DANGER sign plate or a bilingual message.